From Madrid we took a train southeast to the Mediterranean coast and the city of Valencia, Spain’s 3rd largest city. The city was founded in 138 BC by Roman soldiers looking for a place for rest and relaxation. During the 15th and 16th centuries, Valencia was one of the Mediterranean’s strongest trading centers. We began our visit to Valencia with a walking tour of the main highlights of the old city center, beginning at the Cathedral of Valencia which was built over a mosque beginning in the 13th century. The old city of Valencia is relatively compact and very appealing with polished stone plazas and beautiful architecture. The River Turia streamed through the city until the late 1950’s but repeated severe flooding led the city to divert the river to the south. The former riverbed, now known as Jardín del Turia, has become a 10 kilometer ribbon of green space and parkland that arcs through the city. Valencia is surrounded by its huerta, or market gardens that supply much of the produce for Spain and other parts of Europe. The Mercado Central is a beautiful covered market with a soaring steel supported roof and wide aisles lined with stalls piled with fruits, vegetables, meats, bread, seafood and olives showing the bounty of locally produced foods. 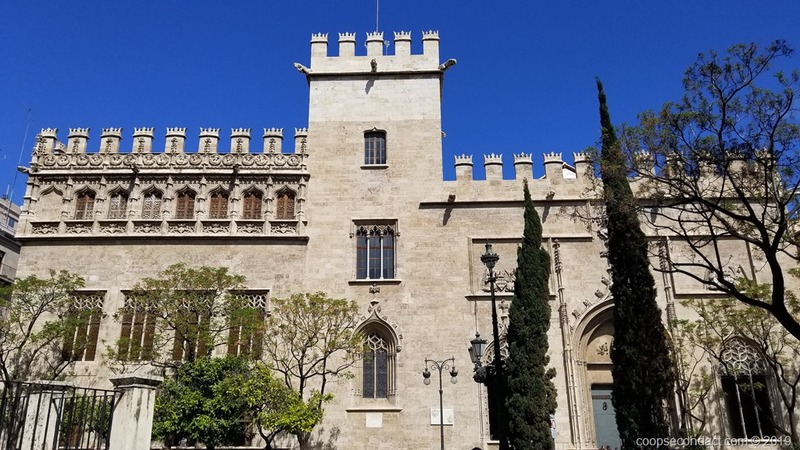 On the steps of the Cathedral of Valencia, the Tribunal de las Aguas (Water Court) meets every Thursday at noon as it has done for more than a thousand years, making it the oldest legal institution in Europe. Their role is to settle any irrigation disputes that arise among the local farmers. Another section of La Lonja has two floors, the upper of which is referred to as the Pavilion of the Consulate of the Sea. This is where a tribunal would convene in order to work out disagreements among traders. It has a lavish coffered ceiling which was brought here from another building. 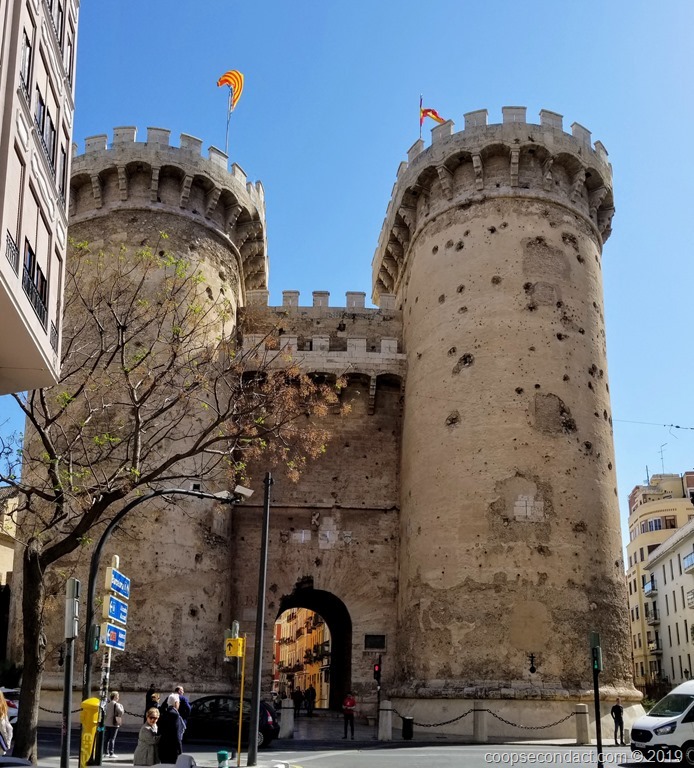 There are two city gates still standing from the 14th & 15th centuries during which time the old city of Valencia was fully walled. Torres de Serranos was the main exit to the north and overlooks the former bed of the Turia River. Torres de Quart, which faces towards Madrid and the setting sun, is Spain’s most magnificent city gate. High on the outside you can see pockmarks caused by French cannonballs during the 19th century Napoleonic invasion. Valencia’s beaches are about 3 km from the city center. We took a walk out to the coast for a view of the Mediterranean on a beautifully sunny day. Playa de las Arenas runs north into Playa de la Malvarrosa and Playa de la Patacona all bordered by a wide promenade. The marina and port area runs to the south. A word about some of the other notable structures we encountered. 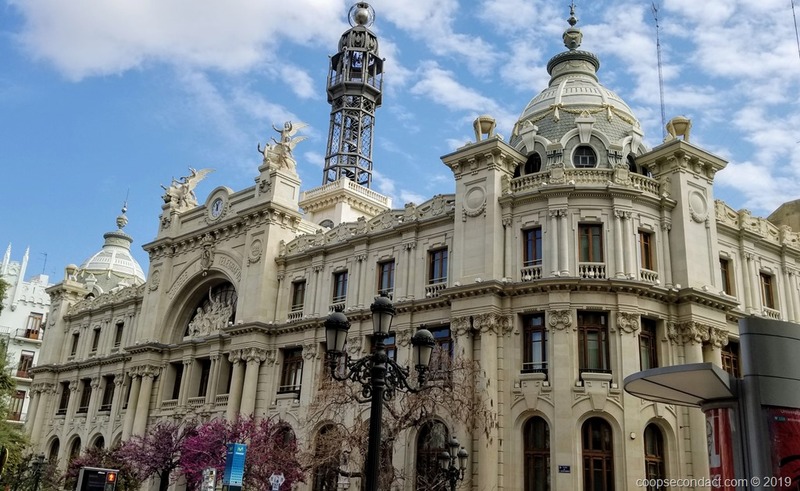 The Estació del Norte, completed in 1917, is a train station located near the city center. The main lobby is decorated with ceramic mosaics and murals while the outside has oranges and greenery on its façade. Plaza de Toros de Valencia, the bullring, was completed in 1859. Its designed was inspired by Roman civil architecture with 384 external arches. The main post office, Edificio de Correros (pictured above) was completed in 1922. While the main entrance is crowned with impressive allegorical figures, you must step inside to see the magnificent leaded glass dome in the lobby. Towards the end of our time in Valencia we finally encountered some rainy weather. This gave us an opportunity for a rest break and time to catch up on other tasks. 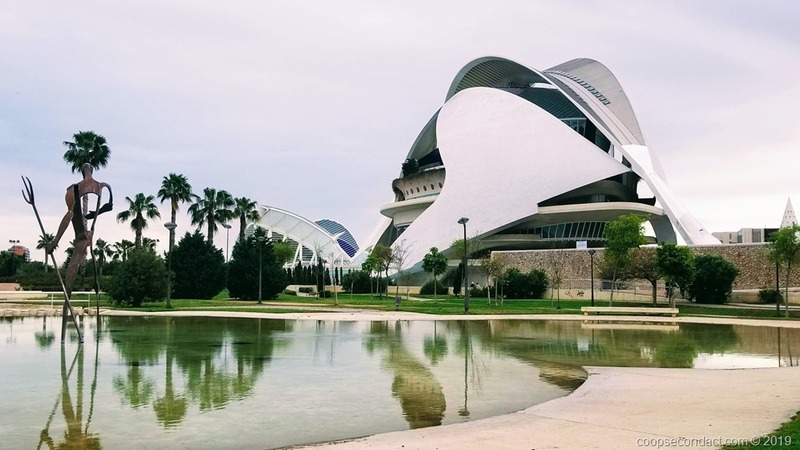 On our final day we did find an opportunity to go have a look at Ciudad de las Artes y las Ciencias, a stunning complex that occupies 350,000 square meters of the old Turia riverbed. It’s occupied by a series of spectacular buildings that are mostly the work of world famous, locally born architect Santiago Calatrava. The principal buildings are an opera house, a science museum, a 3D cinema and an aquarium. Adjacent is the Palau de las Arts Reina Sofia, an ultramodern arts complex that sits over the riverbed like a giant beetle. 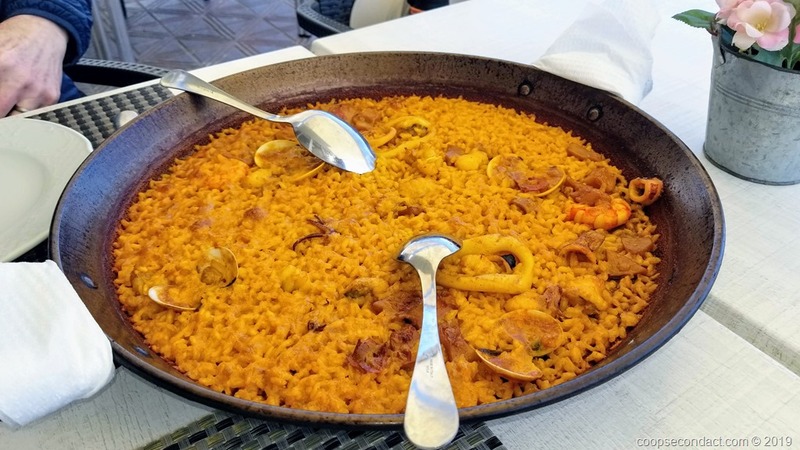 Valencia claims to be the original home for paella, that most Spanish rice dish. We were told that beyond 50 kilometers around Valencia you should forget about paella. The “original” is Paella Valenciana which has chicken and rabbit. Naturally, we had to sample the paella at various places. We had the vegetarian paella and the seafood variety. We enjoyed both very much. Another Valencia mainstay is Agua de Valencia. It starts with fresh orange juice and champagne. Sounds like a mimosa. But then they add gin and vodka so proceed with caution.